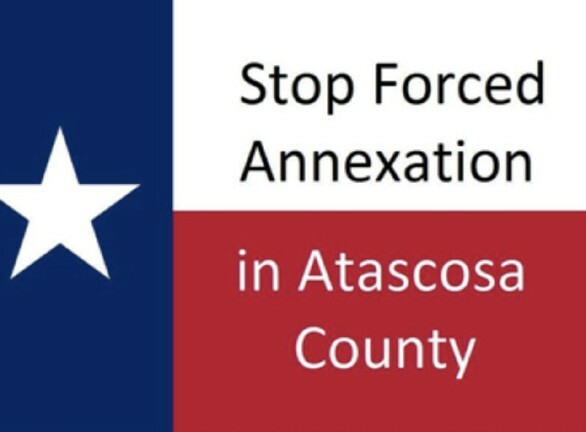 “Signatures are difficult to gather in a short amount of time in a county where many property owners prefer to disconnect from the frenzied hightech style of big city life,” says Marie Levy, organizer of the petition drive Stop Forced Annexation in Atascosa County; but the stakes are high enough in this very important issue that affects all of the county citizens that county officials agreed to put themselves on a tighter schedule to prepare this referendum in order to give the group five extra days to reach the 10 percent of required signatures to get this initiative on the November election ballot. They now have until Sunday, August 5, 2018, to gather 3,000 signatures countywide. The petition calls for Atascosa County to be changed into a Tier 2 county where citizens have the right to vote on whether or not they want to be annexed. Their current Tier 1 status does not offer citizens the option to vote on annexation. Municipalities can simply take the land into their jurisdictions without the approval of the property owners— a process called forced annexation that has been in practice for about 100 years. The Tier 1 and Tier 2 designations were part of Senate Bill 6, a reform legislative effort enforced December 1, 2017, that gave counties with populations over 500,000 the Tier2 status and left the lesser populated counties vulnerable to unilateral takes. There was, however, a caveat included in SB 6. Tier 1 counties, by petition of at least 10% of the registered voters in the county, could “opt-in” a request to be included in a general election ballot to vote on a change or Tier status. Atascosa County is comprised mostly of farm and ranch properties and small communities where landowners have moved for generations to be away from larger municipalities. The products produced on these lands contribute largely to the economy of the small towns within the county limits. Forced annexation would destroy a lifestyle the citizens have “voted with their feet” on when they moved here. With the impending threat of the far-reaching hands of cities like San Antonio to the north, the change of Tier status makes perfect sense. San Antonio can, after all, annex up to five miles per year in any direction. The possibility of it reaching a town like Poteet 5-6 years is a real possibility. This is a pre-emptive move to save natural resources, including water sources, which are sustenance for Atascosa County citizens. A take would not be possible without a vote. Tier 2 status would, at the very least, offer citizens an opportunity to negotiate, rebut or refuse annexation proposals—a right they do not have now. Atascosa County has in the last few years seen a resurgence of farmers, of preserving the land with much more sensitivity, of producing more organic crops. It is becoming a center for permaculture—a growing trend that is more sensitive to the environment. These things, along with the need for ownership of their lands, gave the organizers of the Stop Forced Annexation in Atascosa County, mostly farmers, the impetus to fight for the right to have a vote, to regain their property rights, and a right to live the lives they choose. The petition drive has gained a groundswell of momentum in the last few days and we are certain that this extension will give us sufficient time to reach the needed number of signatures. People are passionate about their property rights. “They come pen in hand ready to sign, the moment they find out about the petition,” says Levy. Twenty volunteers are needed between now and Sunday to put boots on the ground and secure signatures. Please contact Marie Levy, Stop Annexation in Atascosa County, 210-846- 1728 or email levym13@gmail.com. 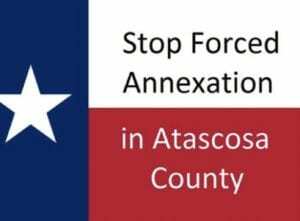 Visit their Facebook page at Atascosa County Stop Forced Annexation for information on this petition and for locations throughout the county to sign.